Winter weather brings its own set of parenting challenges, not the least of which is entertaining little ones in the great indoors for days on end. Get their creative minds cranking and break up the monotony with an art sesh! Painting with toddlers doesn’t have to be stressful—here are a few tips to keep it fun and manageable. 1. Dress for messy success. Toddlers + paint = color everywhere. It’s best to skip the art smocks and dress your little one in old play clothes or an oversized t-shirt that you won’t mind throwing in the wash afterwards. Make sure you’re also rockin’ the faded yoga pants and top as kids are bound to touch your outfit too. 2. Use tempera paint. Unlike acrylic or craft paints, tempera paint is egg-based. This makes it totally non-toxic, and it easily washes out of clothing, carpet and other unlucky bystanders. You can find tempera paint in the craft section of most big box stores (Target, Walmart) and also at craft stores (Michaels, Hobby Lobby). 3. Prep your setup. Cardstock or art paper is preferable to typical printer paper because it can withstand being saturated with moisture. Use low tac tape (like painter’s, masking or washi tape) to secure your paper to your painting surface and prevent it from sliding around. If your table is not easily washable, a large cutting board is a great alternative. 4. Paint with friendly colors. One mistake that leads to a muddy masterpiece is allowing kids access to ALL the colors at once. Instead, choose 2-3 colors that are next to each other on the color wheel and not ones that are opposite from each other. For example, blue, green and yellow are friendly. Blue and orange are not! 5. Place the paint. Small hands sometimes lack the finesse needed to dip and drag paint from containers. 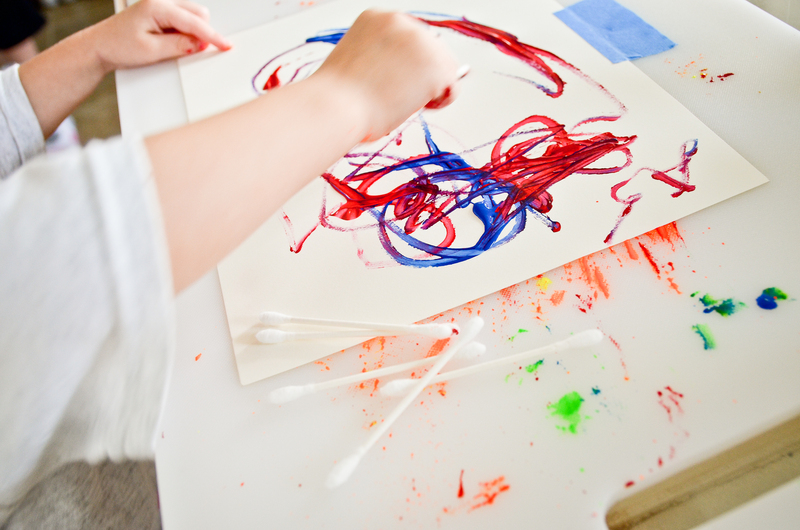 An easy solution is to pre-dab the paint on the paper and encourage your child to swirl the colors together. 6. Experiment with unique “brushes.” Kids love to explore the marks that unusual tools make. Let them paint with their toys, dab with Q-tips, or stamp with paper rolls. Even if you don’t own paintbrushes, a cotton ball held with a clothespin creates a similar effect. 7. Display with love. After their creations are dry, use your low tac tape to “frame” the paper on the wall. Grouping the paintings together in your child’s room creates a special gallery space that your tiny artist will be proud to show off to everyone! Above all, remember to have fun because that’s what painting with toddlers is all about!